El vitiligo es un trastorno de la pigmentación cuyo origen no es claro, secundario a la pérdida de la función de los melanocitos que podría comprometer no solo los melanocitos epidérmicos, sino también, aquellos dispuestos en otros órganos, lo cual sugiere la presencia de enfermedades concomitantes como alteraciones oculares y auditivas, las cuales se revisaran en este artículo. Se propone la necesidad de un examen visual y auditivo en el abordaje integral de los pacientes con vitiligo para descartar dicho compromiso. Vitiligo, síndrome de Vogt-Koyanagi-Harada, uveítis, glaucoma, hipoacusia. Vitiligo is a pigmentation disorder of unclear origin secondary to the loss of function of melanocytes, which could compromise not only epidermal melanocytes but also those established in other organs suggesting the presence of concomitant diseases such as ocular and auditory disturbances. In this review article those associations are reviewed. We suggest the need for a complete visual and auditory exam within the comprehensive approach to patients with vitiligo to rule out their compromise. Vitiligo, Vogt-Koyanagi-Harada disease, uveitis, glaucoma, hypoacusis, visual acuity. Tarlé RG, Nascimento LM, Mira MT, Castro CCS. Vitiligo–Part 1. An Bras Dermatol. 2014;89:461-70. Mahdi P, Rouzbahani M, Amali A, Rezaii Khiabanlu S, Kamali M. Audiological manifestations in vitiligo patients. Iran J Otorhinolaryngol. 2012;24:35-40. Sommer L. Generation of melanocytes from neural crest cells. Pigment Cell Melanoma Res. 2011;24:411-21. Cichorek M, Wachulska M, Stasiewicz A, Tymińska A. Skin melanocytes: Biology and development. Adv Dermatol Allergol. 2013;1:30-41. Hu D-N, McCormick SA, Seedor JA, Ritterband DC, Shah MK. Isolation, purification and cultivation of conjunctival melanocytes. Exp Eye Res. 2007;84:655-62. Sharma L, Bhawan R, Jain R. Hypoacusis in vitiligo. Indian J Dermatol Venereol Leprol. 2004;70:162-4. Roberts DS, Linthicum FH. Distribution of melanocytes in the human cochlea, Otol Neurotol. 2015;36:e99-100. Barozzi S, Ginocchio D, Socci M, Alpini D, Cesarani A. Audiovestibular disorders as autoimmune reaction in patients with melanoma. Med Hypotheses. 2015;85:336-8. Ezzedine K, Eleftheriadou V, Whitton M, van Geel N. Vitiligo. Lancet. 2015;386:74-84. Essien KI, Harris JE. Animal models of vitiligo: Matching the model to the question. Dermatol Sin. 2014;32:240-7. Taieb A, Alomar A, Böhm M, Dell’Anna ML, De Pase A, Eleftheriadou V, et al. Guidelines for the management of vitiligo: the European Dermatology Forum consensus. Br J Dermatol. 2013;168:5-19. Faria AR, Tarlé RG, Dellatorre G, Mira MT, de Castro CCS. Vitiligo—Part 2—classification, histopathology and treatment. An Bras Dermatol. 2014;89:784-90. Bellei B, Pitisci A, Ottaviani M, Ludovici M, Cota C, Luzi F, et al. Vitiligo: A possible model of degenerative diseases. PloS One. 2013;8:e59782. Laddha NC, Dwivedi M, Mansuri MS, Gani AR, Ansarullah M, Ramachandran AV, et al. Vitiligo: Interplay between oxidative stress and immune system. Exp Dermatol. 2013;22:245-50. Cowan CL Jr, Halder RM, Grimes PE, Chakrabarti SG, Kenney JA Jr. Ocular disturbances in vitiligo. J Am Acad Dermatol. 1986;15:17-24. Tsuruta D, Hamada T, Teramae H, Mito H, Ishii M. Inflammatory vitiligo in Vogt-Koyanagi-Harada disease. J Am Acad Dermatol. 2001;44:129-31. Chan EW, Sanjay S, Chang BCM. Headache, red eyes, blurred vision and hearing loss. Can Med Assoc J. 2010;182:1205-9. 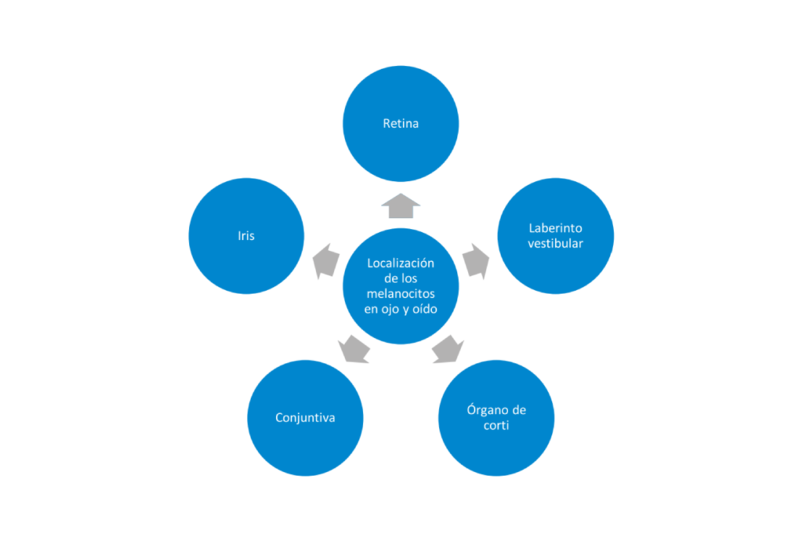 Arévalo JF, García R, Al-Dhibi H, Sánchez J, Suárez-Tata L. Update on sympathetic ophthalmia. Middle East Afr J Ophthalmol. 2012;19:13. Lentz KJ, Burns RP, Loeffler K, Feeney-Burns L, Berkelhammer J, Hook RR. Uveitis caused by cytotoxic immune response to cutaneous malignant melanoma in swine: Destruction of uveal melanocytes during tumor regression. Invest Ophthalmol Vis Sci. 1983;24:1063-9. 20. Abdollahi A, Hallaji Z, Ghiasi M, Afzal AZ. Ocular findings in patients with vitiligo: A case- control study. Tehran Univ Med J. 2011;68:656. Gopal KV, Rama Rao GR, Kumar YH, Appa Rao MV, Vasudev P; Srikant. Vitiligo: A part of a systemic autoimmune process. Indian J Dermatol Venereol Leprol. 2007;73:162-5. 22. Rogosić V, Bojić L, Puizina-Ivić N, Vanjaka-Rogosić L, Titlić M, Kovacević D, et al. Vitiligo and glaucoma – an association or a coincidence? A pilot study. Acta Dermatovenerol Croat. 2010;18:21-6. Duplancić D, Rogosić V, Puizina-Ivić N, Rogosić LV, Luksić B, Kovacić V, et al. Prognostic value of ophthalmic artery color Doppler sonography for progression to glaucoma in vitiligo patients. Acta Med Croatica. 2013;67:47-52. Serin D, Buttanri IB, Parlak AH, Boran C, Tirak E. Impression cytology of the ocular surface and tear function in patients with periocular vitiligo. Eur J Ophthalmol. 2012;22:734-8. Güngör Ş, Nurözler A, Akbay G, Ekşioğlu M. Tear functions in patients with vitiligo. Int J Dermatol. 2015;54:e466-8. 26. Dogan AS, Atacan D, Durmazlar SP, Acar M, Gurdal C. Evaluation of dry eye findings in patients with vitiligo. Pak J Med Sci. 2015;31:587-91. Fournier GA, Albert DM, Wagoner MD. Choroidal halo nevus occurring in a patient with vitiligo. Surv Ophthalmol. 1984;28:671-2. Pai SG. Ocular manifestations of vitiligo: Evaluation and study of any possible association. Online J Health Allied Sci. 2016;14:1-3. Biswas G, Barbhuiya JN, Biswas MC, Nazarul Islam MD, Dutta S. Clinical pattern of ocular manifestations in vitiligo. J Indian Med Assoc. 2003;101:478-80. 30. Albert DM, Nordlund JJ, Lerner AB. Ocular Abnormalities Occurring with Vitiligo. Ophthalmology. 1979;86:1145-58. Albert DM, Wagoner MD, Pruett RC, Nordlund JJ, Lerner AB. Vitiligo and disorders of the retinal pigment epithelium. Br J Ophthalmol. 1983;67:153-6. 32. Wagoner MD, Albert DM, Lerner AB, Kirkwood J, Forget BM, Nordlund JJ. New observations on vitiligo and ocular disease. Am J Ophthalmol. 1983;96:16-26. 33. Örnek N, Onaran Z, Koçak M, Örnek K. Retinal nerve fiber layer thickness in vitiligo patients. J Res Med Sci. 2013;18:405-7. Tang M, Pawlyk BS, Kosaras B, Berson EL, Sidman RL. ERG abnormalities in relation to histopathologic findings in vitiligo mutant mice. Exp Eye Res. 1997;65:215-22. Nir I, Ransom N, Smith SB. Ultrastructural features of retinal dystrophy in mutant vitiligo mice. Exp Eye Res. 1995;61:363-77. Ayotunde A, Olakunle G. Ophthalmic assessment in black patients with vitiligo. J Natl Med Assoc. 2005;97:286-7. Shoeibi N, Taheri A, Nikandish M, Omidtabrizi A, Khosravi N. Electrophysiologic evaluation of retinal function in patients with psoriasis and vitiligo. Doc Ophthalmol. 2014;128:131-6. 38. Sakata VM, da Silva FT, Hirata CE, de Carvalho JF, Yamamoto JH. Diagnosis and classification of Vogt–Koyanagi–Harada disease. Diagn Criteria Autoimmune Dis. 2014;13:550-5. 39. Greco A, Fusconi M, Gallo A, Turchetta R, Marinelli C, Macri GF, et al. Vogt–Koyanagi–Haradasyndrome. Autoimmun Rev. 2013;12:1033-8. Ruiz-Allec LD, Peñaloza-López YR, Ocaña-Plante N del R, Valdivia-Muñoz MB, Martínez-Castro F. Vestibular findings in patientswithVogt-Koyanagi-Haradasyndrome. Acta Otorrinolaringol. 2009;60:305-10. Bulbul Baskan E, Baykara M, Ercan I, Tunali S, Yucel A. Vitiligo and ocular findings: A study on possible associations. J Eur Acad Dermatol Venereol. 2006;20:829-33. Shankar DSK, Shashikala K, Madala R. Clinical patterns of vitiligo and its associated co morbidities: A prospective controlled cross-sectional study in South India. Indian Dermatol Online J. 2012;3:114-8. Guadarrama-Bahena D, Arroyo-Yllanes ME, Magaña-García M, Madrigal-Pichardo BI. 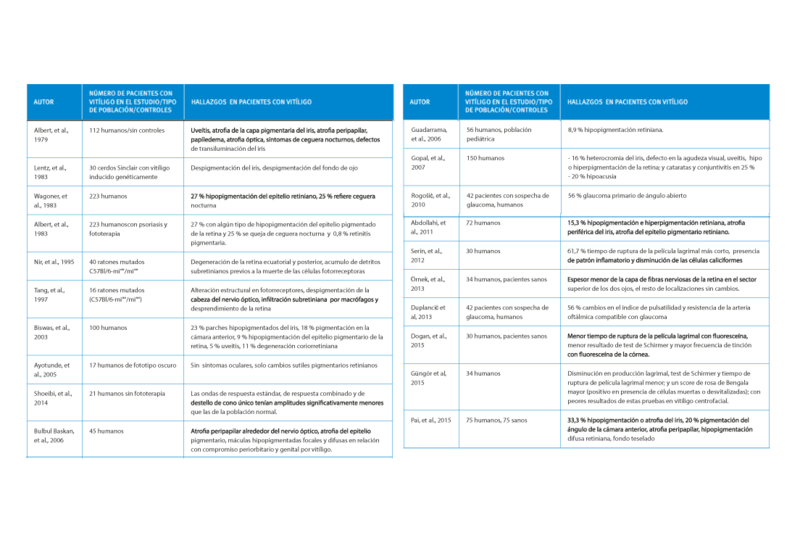 Prevalencia de alteraciones oftalmológicas en pacientes pediátricos con vitíligo. Rev Mex Oftalmol. 2003;77:6-9. Tosti A, Bardazzi F, Tosti G, Monti L. Audiologic abnormalities in cases of vitiligo. J Am Acad Dermatol. 1987;17:230-3. Özüer MZ, Şahiner T, Aktan Ş, Şanli B, Bayramoğlu İ. Auditory evoked potentials in vitiligo patients. Scand Audiol. 1998;27:255-8. Al-Mutairi N, Al-Sebeih K. Late onset vitiligo and audiological abnormalities: Is there any association? Indian J Dermatol Venereol Leprol. 2011;77:571-6. Orecchia G, Marelli MA, Fresa D, Robiolio L. Audiologic disturbances in vitiligo. J Am Acad Dermatol. 1989;21:1317-8. Hong CK, Lee MH, Jeong KH, Cha CI, Yeo SG. 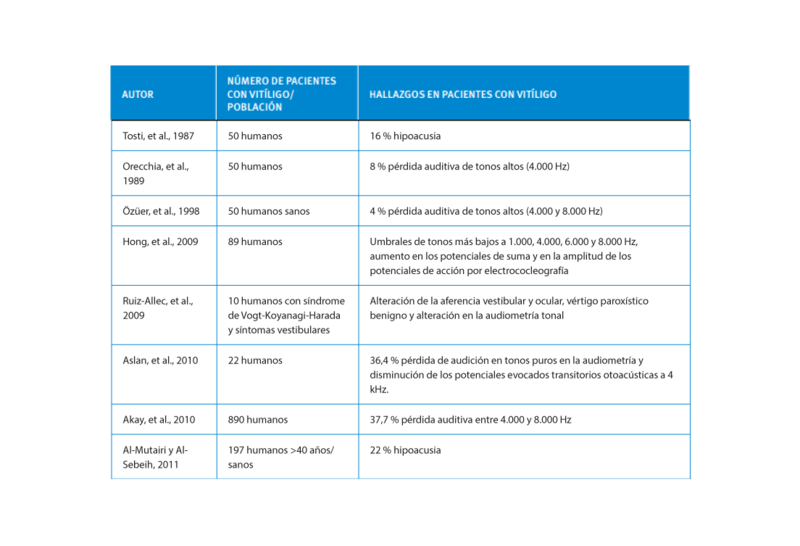 Clinical analysis of hearing levels in vitiligo patients. Eur J Dermatol. 2009;19:50-6. Yamaguchi Y, Hearing VJ. Melanocytes and their diseases. Cold Spring Harb Perspect Med. 2014;4 a017046. Huggins RH, Janusz CA, Schwartz RA. Vitiligo: A sign of systemic disease. Indian J Dermatol Venereol Leprol. 2006;72:68-71. Yu H-S. Melanocyte destruction and repigmentation in vitiligo: A model for nerve cell damage and regrowth. J Biomed Sci. 2002;9:564-73. Akay B, Bozkir M, Anadolu Y, Gullu S. Epidemiology of vitiligo, associated autoimmune diseases and audiological abnormalities: Ankara study of 80 patients in Turkey: Clinical, laboratory and genetic aspects of vitiligo. J Eur Acad Dermatol Venereol. 2010;24:1144-50. Que SKT, Weston G, Suchecki J, Ricketts J. Pigmentary disorders of the eyes and skin. Clin Dermatol. 2015;33:147-58.